Students will be learn how the Tinker decision opened student free expression rights. Students will reflect on the purpose and importance of this decision. Students will brainstorm how they could take action on a topic of their choice. How have teens become more civically engaged during the past five years? Ask two students to volunteer to read what they wrote. Following that, tell the students today (Jan. 30, 2019) is Student Press Freedom Day, as deemed by the Student Press Law Center. In honor of this day, we are going to look at a video and then write about what we learned and then plan what we could do to help educate others on freedom of the press. Prior to watching the video number the students off from 1-5. Each group will be responsible for watching the video for content and then discussing it with their group. All students should take notes and agree on what they see. (They will be teaching others in small groups later in Step 5.) The first content specific prompt is below. Tell students they will have 5 minutes after the video to talk in their group about the assigned content. Who is Mary Beth Tinker? What inspired her? What was the situation behind her suspension for school? She says she didn’t know such small action make a big difference — what does this mean? What happened to her after the suspension? What did the Supreme Court decide and why is it important? Because of ads, teacher may want to cue the video ahead of time. Ask students to assemble into their groups. Tell them they will have 5 minutes to brainstorm on the assigned topic. Teacher may want to walk around and redirect as necessary. Students should share ideas and everyone in the group should write down the answers as discussed by the group. Now that they have a basic understanding of the case, watch the video again. Ask students to write down any instance — either overt or subtle — of a way students can be active as shown in the video. Students should link the student action to one of the five freedoms guaranteed by the First Amendment. These could be overt or subtle in form. Tell them they will have 5 minutes to brainstorm on the rights shown in the video. Teacher may want to walk around and redirect as necessary. Students should share ideas and everyone in the group should write down the answers as discussed by the group. Again, get in groups and discuss how these were present in the video. If time allows, list ways in which you can make a difference in your community or school. As this is happening, teacher should walk around and give whiteboard markers to half the class to prepare for the next step. As student groups finish, ask those with whiteboard markers to write one action they learned. After students write these, have a small discussion on the content provided. Teacher should pass out the Tinker cards. Please remember, these should be on cardstock. Tell students they may write a card to Mary Beth Tinker. What they write is up to them. They could thank her, tell how she’s inspired them, etc. 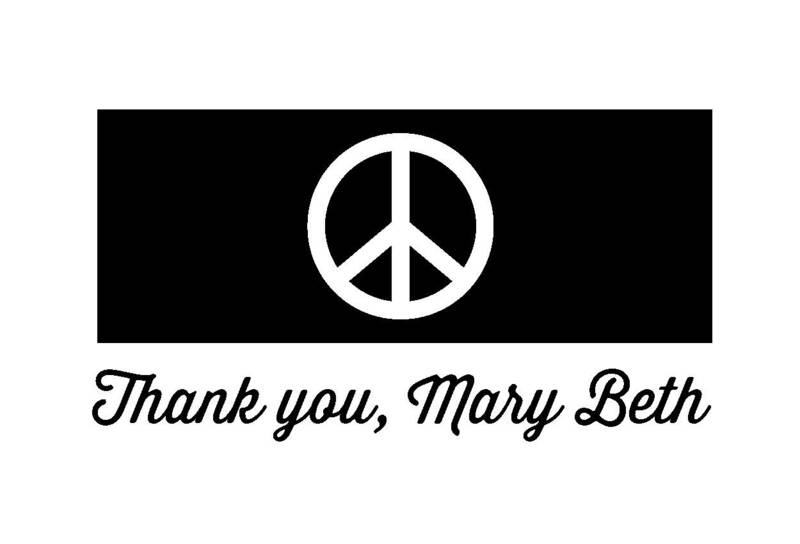 Tell them you will be sending these for delivery to Mary Beth Tinker on the 50th anniversary of the Tinker decision. Teachers, please send cards to Candace Bowen, 4822 Shining Willow, Stow, OH 44224. Cards must be received at this address by Feb. 16, 2019. Have students pick a topic and research what others have done to work on the issue. For example, it could be as basic as dress codes or participation in a school assembly. It also could be contacting your local representatives concerning climate change. Thank you for this lesson idea.